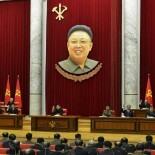 Kim Jong Un shakes hands on March 5, 2015 in the WPK Central Committee #1 Office Complex. 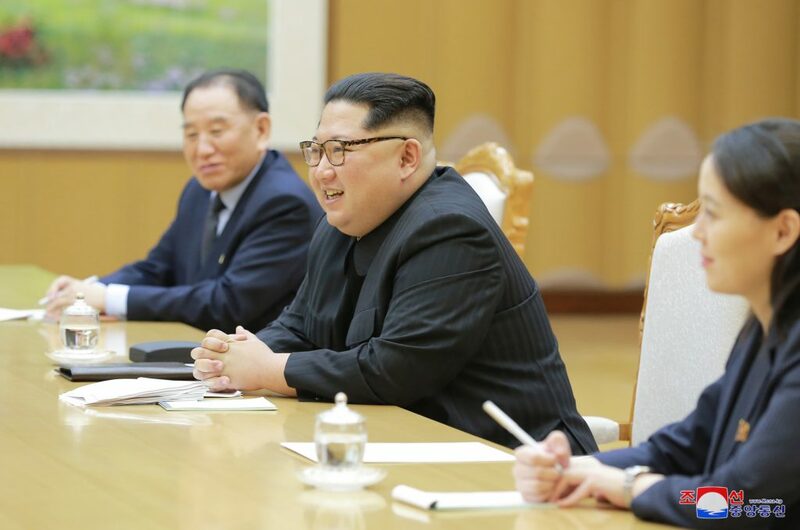 Also in attendance (background) are CPRC Chairman Ri Son Gwon and Kim Yo Jong (Photo: Rodong Sinmun/KCNA). 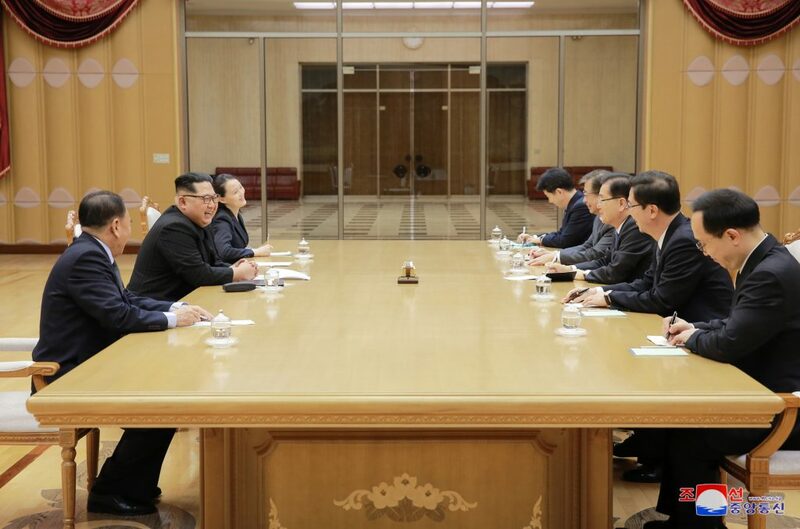 Kim Jong Un [Kim Cho’ng-u’n] met and dined with a high-level delegation from the ROK on the evening [KST] of March 5 [Monday]. 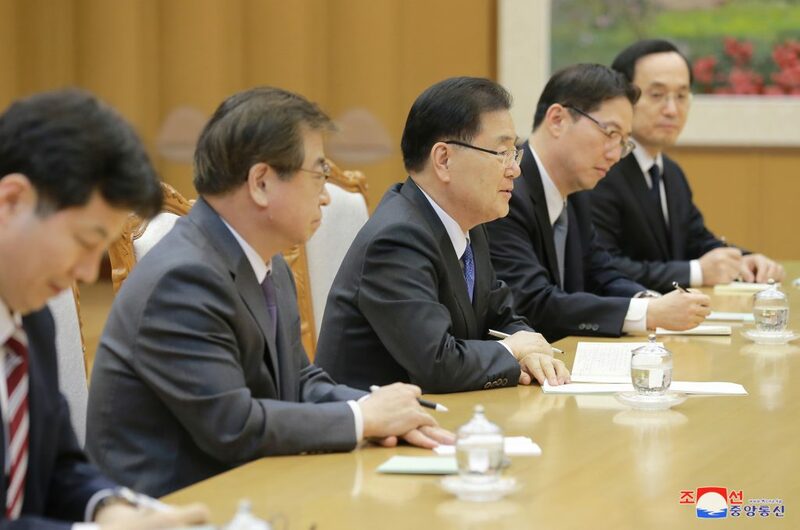 Also in attendance were Workers’ Party of Korea [WPK] Vice Chairman and Director of the United Front Department Kim Yong Chol [Kim Yo’ng-ch’o’l], Personal Secretariat and Senior WPK Central Committee Department Deputy Director Kim Yo Jong [Kim Yo’-cho’ng] and Chairman of the Committee for the Peaceful Reunification of the Country [formerly known as the Committee for the Peaceful Reunification of the Fatherland] Ri Son Gwon [Ri So’n-kwon]. 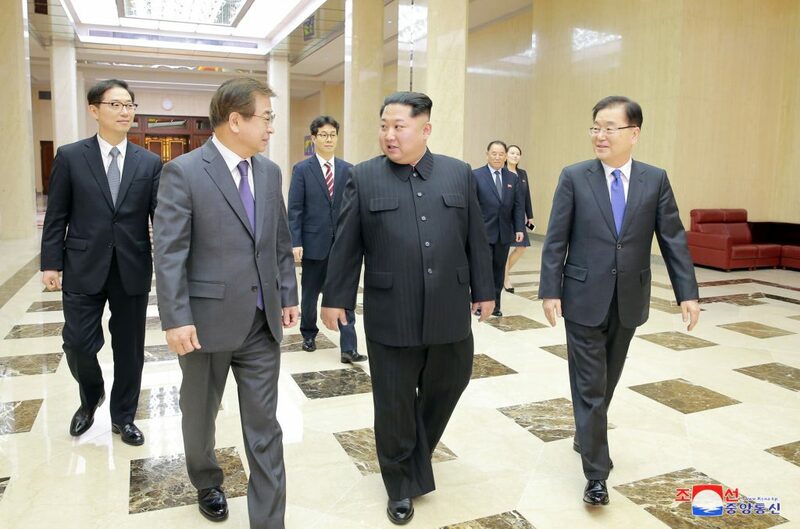 Attending from the ROK were Ch’o’ngwade Security Security Chung Eui-yong [Cho’ng U’i-yo’ng], National Intelligence Service [NIS] Director So Hun [So’ Hun], Vice Minister of Unification Chon Hae Song [Chon Hae-so’ng], NIS Deputy Director Kim Sang Gyun [Kim Sang-kyun] and Ch’o’ngwadae State Affairs Situation Office Yun Kon Yong [Yun Kon-yo’ng]. 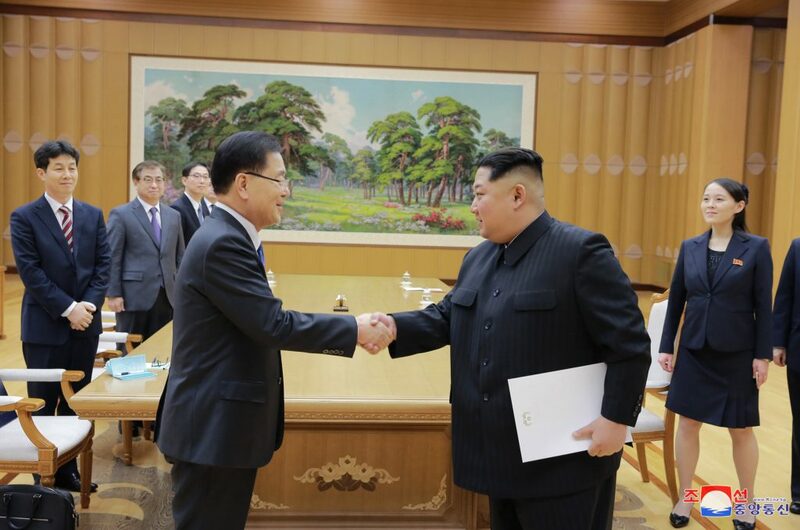 After the meeting, Jong Un posed for commemorative photos with the ROK delegation. 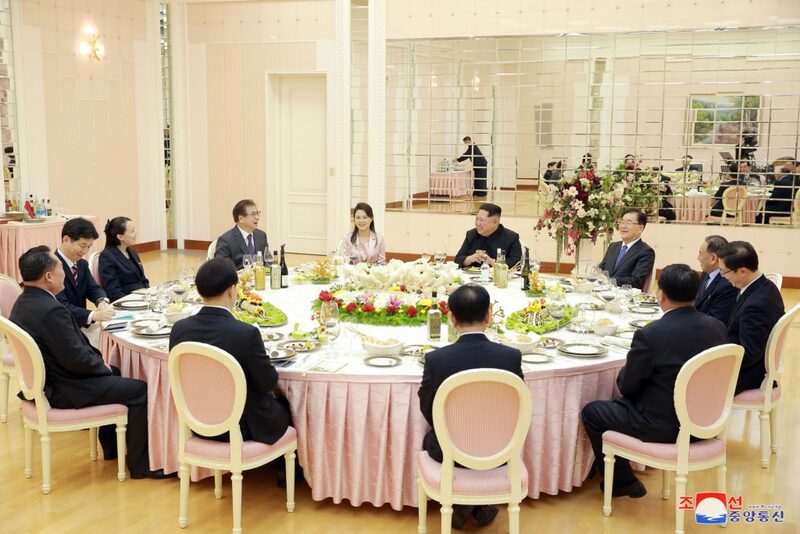 Then, along with his wife Ri Sol Ju [Ri So’l-chu] and other senior DPRK officials, he hosted a dinner for President Moon’s representatives. 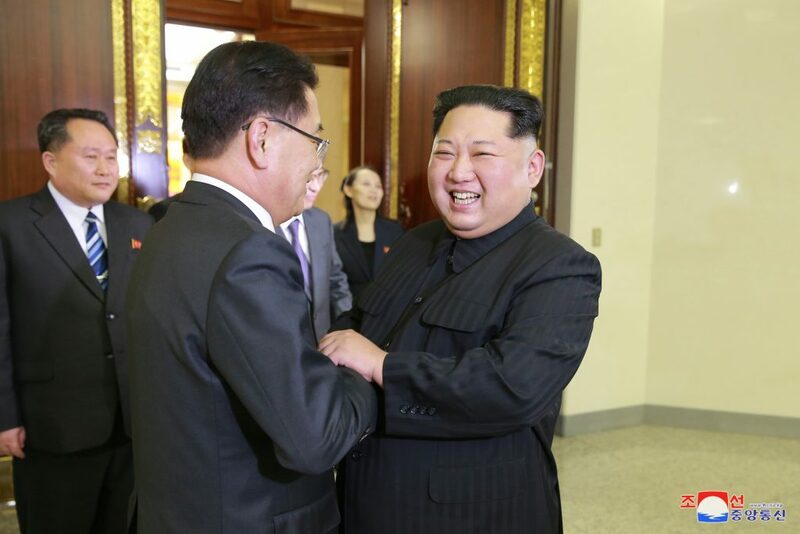 This article was written on 06 Mar 2018, and is filled under 2018 DPRK-ROK Cultural Exchanges, 2018 DPRK-ROK Interactions, 2018 DPRK-ROK Sports Exchanges, 2018 Strategic Rhetoric, Central Committee, Central Military Committee, Central Party Affairs/Cadres 5th Section, Committee for the Peaceful Reunification of Korea, Committee for the Peaceful Reunification of the Fatherland (CPRF), Democratic Front for the Reunification of the Fatherland, DPRK Cabinet, DPRK Diplomat Corps, DPRK External Relations, DPRK Intelligence Community, DPRK military engagement, DPRK military provocation, DPRK-US Relations, Events Management Section, Executive Policy Bureau, Gen. Kim Yong Chol, General Affairs, Guard Command, Inter-Korean Relations, International Affairs Department WPK, International Department, June 15 Joint Declaration, Kim Chong-un inspections, Kim Family, Kim Jong Un Visits, Kim Jong-un, Kim Yo Jong, Kim Yo-chong, KJI Personal Secretariat, Korean Workers' Party (KWP), Ministry of State Security, Organization and Guidance Department, Political Bureau, Pyongyang Defense Command, Reconnaissance Bureau, Ri Sol Ju (Kim Jong Un's wife), Ri Son Gwon (CPRC/UFD), Secretariat, State Affairs Commission, State Security Department, Supreme People's Assembly, United Front Department.